Band-in-a-Box® 2019 for Windows® is here! NEW! Band-in-a-Box® VST DAW Plugin. This is a separate application that works directly inside your DAW (Cakewalk, Reaper, Pro Tools, PreSonus, etc.) to generate styles, RealTracks, RealDrums, Multi-Riffs, and more. Band-in-a-Box® is so easy to use! Just type in the chords for any song using standard chord symbols (like C, Fm7, or C13b9), choose the style you'd like, and Band-in-a-Box® does the rest... Band-in-a-Box® automatically generates a complete professional-quality arrangement of piano, bass, drums, guitar, and strings or horns. RealTracks add the human element of great session musicians to your songs and with 202 more RealTracks available in version 2019 there is over 2,700 hours of studio musicians' recordings that you can use in your songs! Overview for Windows and Mac. Everything you need to know in less than 6 minutes! Get all 162 RealStyles in 4 volumes: Rock-Pop 6, Jazz 6, Country 6, and Traditional Folk & Jazz 1 for only $49! April 23, 2019French Band-in-a-Box® 2019 for Windows is Here! April 18, 2019German Band-in-a-Box® 2019 for Windows is Here! April 17, 2019Band-in-a-Box® 2018 for Mac Build 266 Available! April 08, 2019Video - Part 2 How to anticipate an eighth or a sixteenth note on any beat? April 04, 2019Video - How to anticipate an eighth or a sixteenth note on any beat? March 25, 2019Introducing the Vocals of Shane McConnell! March 22, 2019Learn More About the Redesigned Band-in-a-Box® SongPicker! March 21, 2019TBT - Band-in-a-Box® 2015 Sound Bytes Review! April 16, 2019Requested Video - Using the BB VST Plugin in RealBand! March 05, 2019YouTube Find - EricBlackMonGuitar How-to's with Band-in-a-Box® Backing Tracks! February 04, 2019PowerTracks Pro Audio 2019 is Here! February 01, 2019The 2018 User Showcase Awards! January 30, 2019RealBand 2019 Build Update 3 Available! 202 more RealTracks (Sets 301-328) available with great new Pop, Rock, Jazz, Blues, Funk, Americana, Country and World styles. Plus, there's 40 additional RealTracks in the 2019 49-PAK. Included with version 2019 is the new Band-in-a-Box® VST DAW Plugin. This is a separate application that works directly inside your DAW (Cakewalk, Reaper, ProTools, PreSonus, etc.) to generate styles, RealTracks, RealDrums, Multi-Riffs, and more. The completely redesigned SongPicker now shows information for up to 50,000 songs and has useful filter and search features. Search for RealTracks, RealDrums, and MIDI SuperTracks with the new Advanced Filter options, and much more! Learn about all the great new features and enhancements here! 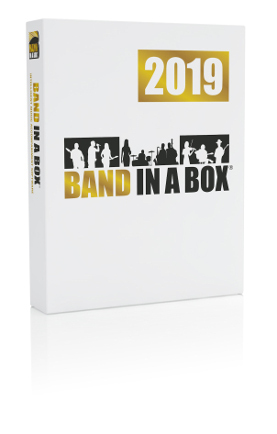 Band-in-a-Box® 2019 for Windows includes version 2019 of RealBand, your All-in-One Audio Workstation and Accompaniment program with over 30 new features. What is Band-in-a-Box for Windows? 162 RealStyles in 4 volumes: Rock-Pop 6, Jazz 6, Country 6, and Traditional Folk & Jazz 1 for just &dollar;49! Learn more. Introducing Video RealTracks! These work just like RealTracks, but also include videos of the musician's performance! Sets 1-6 with 40 Video RealTracks in Country, Pop, and Jazz. 202 more RealTracks (Sets 278-300) available, plus 40 additional RealTracks in the 2018 49-PAK. The Audio Chord Wizard has been redesigned and is now built into Band-in-a-Box. The new Piano Roll window enables precise graphic editing of MIDI data. Notation support has been added for time signatures like 12/8, 9/8, and 6/8. Learn more about the 50+ new features and enhancements here! What is Band-in-a-Box for Mac?